Organized in Hot Springs, Arkansas, in 1914, the Assemblies of God (AG) is one of the largest Christian denominations in the United States. The American South and Mississippi were early centers of strength. Today the AG ranks as the leading denomination of Pentecostalism and the global charismatic movement. In 2013 it claimed 12,792 churches and 3,127,857 adherents in the United States, part of a worldwide following of more than 67,000,000. The Mississippi District alone included 170 churches and 16,570 adherents. That number does not include members in the church’s Southeastern Spanish District, which stretches from Mississippi to North Carolina. Certain doctrines and practices distinguish the AG and other Pentecostal groups from non-Pentecostal churches. Like others in this spirit-centered movement, many members of the AG speak in tongues (glossolalia), which they believe is a sign of Spirit baptism, or the infilling of the Holy Ghost. They also practice faith healing and believe in a variety of signs and wonders. (Pentecostals largely fashion their religious lives on the New Testament book of Acts and hence are often described as restorationists.) Pentecostals and charismatics have pioneered free church worship, including chorus singing, multimedia presentations, and lively congregational participation. Moreover, they are deeply committed to missions. Many first-generation AG enthusiasts had once associated with other holiness and Pentecostal groups. Holiness believers in the South—many of whom championed sanctification, a religious work that liberates individuals from the grip of sin—organized loosely in holiness associations. Regardless of affiliation, all were united by their belief in the imminent return of Jesus, their interest in healing, and their openness to new religious experiences. Much of the AG’s membership was once linked to Charles Fox Parham’s Apostolic Faith organization, which spread through Kansas, Texas, Arkansas, and Missouri. In 1901 students at Parham’s Bible school and healing home in Topeka, Kansas, spoke in tongues, in much the same way, they believed, as the apostles experienced in the second chapter of Acts. They interpreted this charism as a manifestation of the Spirit and preparation for foreign missions. One of Parham’s students, William J. Seymour, an African American preacher from Louisiana, took the apostolic message to Los Angeles in 1906 and organized the now famous Azusa Street Revival—marked by emotional worship and interracialism—which spread the Pentecostal message of tongues speech and the Second Coming of Jesus across the United States. Mississippi native Charles Harrison Mason, black holiness leader of the Church of God in Christ (COGIC), was one of many southern pilgrims to the West Coast meeting. He, like others, returned convinced that what he saw and heard was the second Pentecost he had anticipated. In 1907 two white southern holiness ministers, H. G. Rodgers and M. M. Pinson, attended Pentecostal services at Mason’s church in Memphis. After observing others worship, both spoke in tongues. They conducted a series of revivals and established white Pentecostalism and later the AG in Mississippi. Congregations in Alabama and Mississippi looked to the two men for spiritual guidance. Pinson ushered Elmer E. Van Ness and William George Mizelle into the Pentecostal fold. As a result, the holiness camp meetings that Mizelle and Van Ness operated in DeSoto and Hurley, Mississippi, became crucial to the spread of Pentecostalism in the state. Mason formed ties with other white seekers in the region as well. In 1911 he allowed white Pentecostals in Arkansas, Texas, Alabama, and Mississippi to join the COGIC, which was already an incorporated denomination. White ordained ministers could then receive reduced train fares and other benefits of official organization. When this group of whites united with other, like-minded adherents in 1914, forming the AG, they hoped to stem the tide of religious fanaticism, put an end to financial scandals, and organize around key doctrinal and governmental principles. 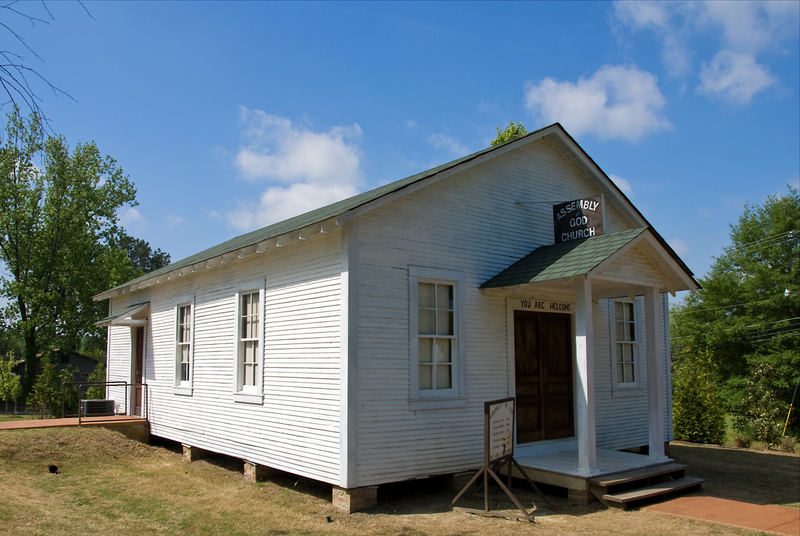 At the 1914 General Council, the denomination endorsed the Neshoba Holiness School, near Union, Mississippi, operated by a recent convert to Pentecostalism, Reuben Benjamin Chisolm. Theological and personal controversies quickly erupted among Pentecostals. Disciples wrangled over the Trinity. The AG anathematized nontrinitarian, Oneness Pentecostals. The faithful fought with one another over the role of traveling, healing evangelists. And members of the AG later disagreed over the ethics of military service, the place and ordination of African Americans in a nearly all-white church, and the role of women in the ministry. The church now ranks as one of the most conservative denominations in the United States on a wide range of issues—evolutionary science, abortion, feminism, homosexuality, environmentalism, and theology. At the same time the AG in Mississippi and elsewhere has distinguished itself for its innovative use of latest technology and its sophisticated organizational strategies. AG churches have been unencumbered by much of the formalism and tradition that shaped so many mainline churches. Hence, the denomination has pioneered the use of print, TV, radio, and the Internet to spread its Pentecostal Gospel. It is little wonder that such musical trailblazers as Elvis Presley and Jerry Lee Lewis credited AG church music with inspiring them. In the mid-twentieth century Mississippi natives such as Edgar W. Bethany and James E. Hamill emerged as influential AG leaders. (Bethany’s daughter, Jan Crouch, and her husband, Paul, established Trinity Broadcasting Network, a Pentecostal TV empire.) Since 2009 Rev. Bob Wilburn has served as the Mississippi District superintendent. The church’s state headquarters is in Jackson. Though churches are scattered throughout Mississippi, the denomination is weakest in the Delta. Members of the Mississippi District sponsor several outreach programs, including Convoy of Hope, which distributes food and clothing and offers medical assistance to the needy. The district also supports approximately ten foreign missionaries and ten domestic missionaries. The AG also assists a gospel radio station, WEEZ-AM 890, in Laurel. The church operates two camp meeting sites in the state, one in Kosciusko, in the center of Mississippi, and another outside of Jackson. Nearly one hundred years after its founding, the AG continues to grow rapidly and draw converts from all classes and, more than ever, races. As of 2013, about 11 percent of those in the denomination’s Mississippi District are African American and about 4.5 percent are Latino; eight churches are majority-black, and four more are majority-Latino.